The present day Kingdom of Saudi Arabia was once known as the Kingdom of Hejaz and Najed in the early 1920s. Hejaz was under the greater Ottoman Empire and was under the direst control of the Turks since 1845. The Turks laid a railway system between the city of Medina and Damascus known as the Hejaz Railway and issued a number of railway stamps. The Turks also opened post offices in the cities of Abha, El Ula, Jeddah, Mecca, Taif, Tabouk, Yanbo and many other places. Before the Turks, an Egyptian post office functioned at the port city of Jeddah between 1865-1881. The first stamp of Hejaz was issued in October 1916. 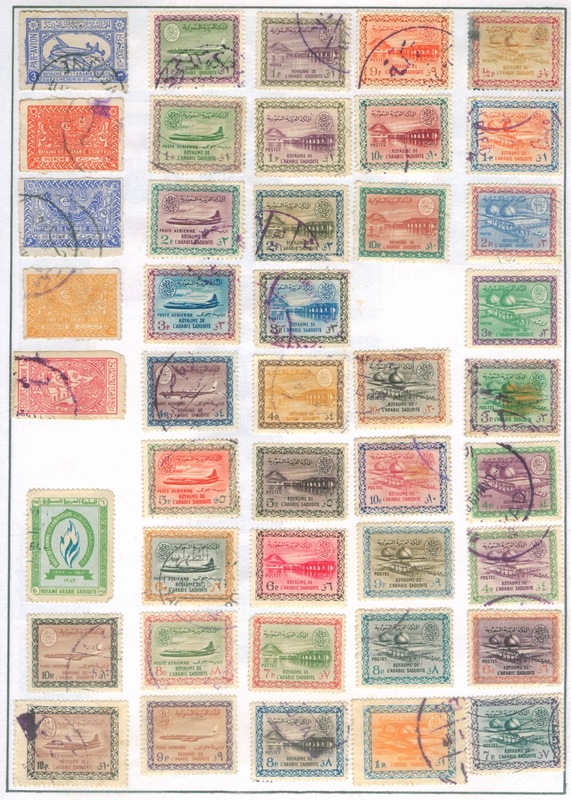 The stamps continued till 1925, when Najed took control of the Kingdom of Hejaz. And from then on, stamps were issued under the Kingdom of Najed. On 8 January 1926, Abdul Aziz Ibn-e-Saud, the king of Nejd was crowned as the King of Hejaz in the Grand Mosque of Mecca. He also assumed the title of the King of Nejd. The first stamp of the new kingdom was issued in February 1926. However, upon renaming of the Kingdom of Hejaz and Nejd as Kingdom of Suaida Arabia in 1930s, the first stamp bearing the description “Saudi Arabia” was issued on 1 January 1934. The four stamps after the first stamp in the top left column from my stamp album above were issued in the 1930s. The first stamp (aeroplane in blue) was issued in 1949 as a part of a set of two stamps (the other stamp was in red colour). The remaining stamps were generally issued in the 1960s.